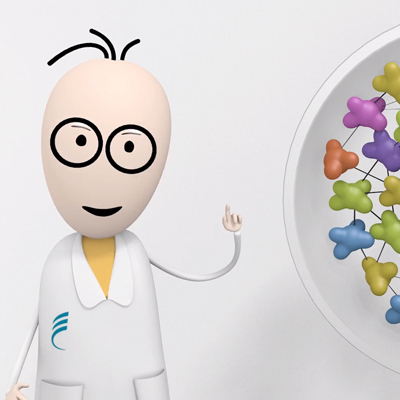 The total AMPK kit is designed to monitor the level of cellular AMP-activated protein kinase and can be used as a normalization assay for the phospho AMPK kit. 5' AMP-activated protein kinase (AMPK) is considered the metabolic master switch. AMPK is activated by phosphorylation on Thr172 by CaMKK2 and LKB1, among others. Upon activation, it inhibits synthesis of fatty acids, cholesterol, and triglycerides, and activates fatty acid uptake and ß-oxidation as well as stimulating glucose uptake. AMPK is also involved in autophagy activation through direct phosphorylation of ULK1. 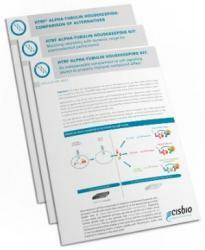 Cisbio's cell-based homogeneous HTRF kit for total AMPK enables the detection of the AMPK expression level, and is used as a normalization assay with our phospho-AMPK (Thr172) kit. The Total-AMPK assay quantifies the expression level of AMPK in a cell lysate. Contrary to Western Blot, the assay is entirely plate-based and does not require gels, electrophoresis or transfer. The Total-AMPK assay uses two labeled antibodies: one coupled to a donor fluorophore, the other to an acceptor. Both antibodies are highly specific for a distinct epitope on the protein. In presence of AMPK in a cell extract, the addition of these conjugates brings the donor fluorophore into close proximity with the acceptor and thereby generates a FRET signal. 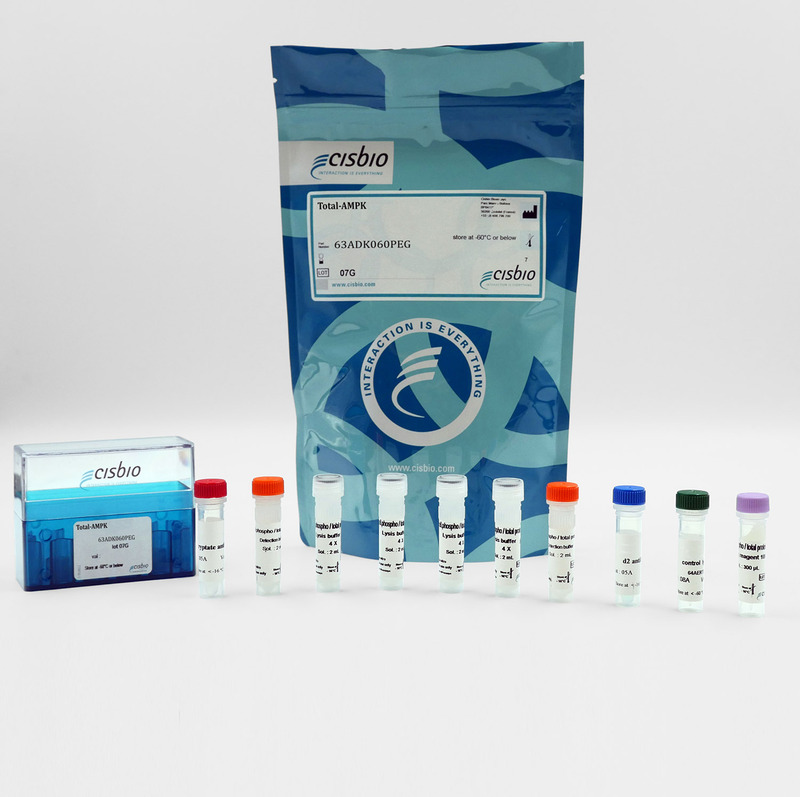 Its intensity is directly proportional to the concentration of the protein present in the sample, and provides a means of assessing the proteins expression under a no-wash assay format. The 2 plate protocol involves culturing cells in a 96-well plate before lysis then transferring lysates to a 384-well low volume detection plate before adding Total AMPK HTRF detection reagents. 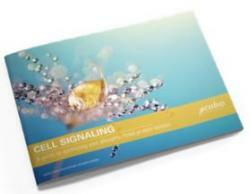 This protocol enables the cells' viability and confluence to be monitored. 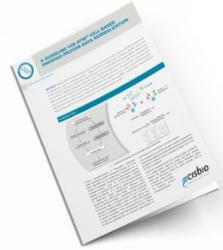 Detection of total AMPK with HTRF reagents can be performed in a single plate used for culturing, stimulation and lysis. No washing steps are required. This HTS designed protocol enables miniaturization while maintaining robust HTRF quality. Cells were seeded in a T175 flask in complete culture medium and incubated for 2 days until reaching 80% confluency. After treatment with H2O2, cells were lysed and soluble supernatants were collected after a 10 minute centrifugation. 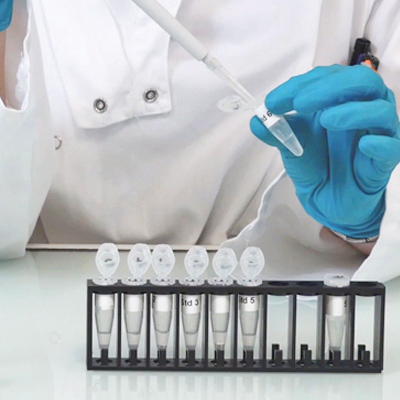 Serial dilutions of the cell lysate were performed in the supplemented lysis buffer and 16 µL of each dilution was transferred into a 384-well low volume white microplate before adding 4 µL of the HTRF total-AMPK detection reagents. HTRF signal was recorded after an overnight incubation.